Graduate students Diku Sherpa and Alfred Brennan measure turbidity from dirt trail runoff in the Red Hills, Tuolumne County. Photo by Matt Cover. Diku Sherpa is studying biodiversity in Sierra Nevada meadows. She has been tracking streamflow during California's summer dry season to see if methods used to rapidly assess meadow conditions can be accurately correlated with other indicators of ecosystem health, like the presence of certain kinds of aquatic insects. Sherpa was born in Nepal and moved to South Lake Tahoe as a teen to rejoin her father, who had immigrated years earlier. She began interning with the U.S. Forest Service (USFS) while still in high school, completed her undergraduate degree at Sonoma State, and continued doing summer internships with the agency. Today, she is a graduate student at California State University, Stanislaus (also known as Stan State) in Turlock where she is working toward her goal of becoming a USFS hydrologist. Diku Sherpa surveying a meadow stream. Photo by Matt Cover. Sherpa traveled a long path to Stan State, and supporting her research process and career goals is important to her advisor, Matt Cover. In Cover's lab, the projects are generally organized around freshwater biodiversity, but the specific research questions are driven by student interests. Most Stan State students were born and raised in the San Joaquin Valley. Over half are also the first in their families to attend college. Cover works to make sure that his students feel that science and science careers are accessible to them. Cover adds that despite their excellent abilities to recognize patterns and processes in nature, “the most challenging aspect of teaching undergraduates is convincing them that they are doing science, that they are scientists, that science is not just done by men in lab coats using expensive equipment.” To counter that sense, he tends to engage students early and often in field and lab work. As an example, for the past five years Cover has been collaborating with colleagues Joe Zermeño at Modesto Junior College and Meg Gonzalez of the Tuolumne River Trust. Every month, they bring together local residents and students from the junior college and Stan State to monitor water quality in the lower Tuolumne River, including surveying the benthic macroinvertebrate community in the river. 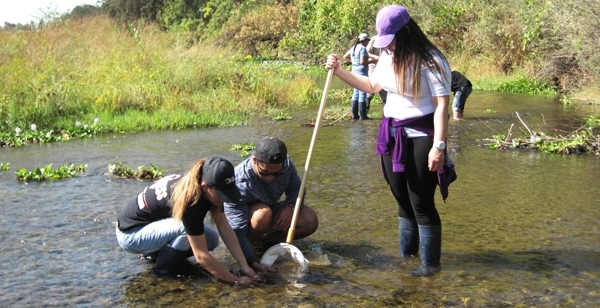 David Son, an undergraduate at CSU Stanislaus, working with two students from Modesto Junior College to sample invertebrates in the Tuolumne River. Photo by Matt Cover. Cover says he values the collaboration for a variety of reasons, particularly because many of the junior college students finish their bachelor degrees at Stan State and he has the opportunity meet them early in their studies. Cover is currently expanding the program to include local high school students, such as Turlock High School teacher Ryan Hollister's advanced placement environmental science classes. The interaction between undergraduate and graduate students is also valuable. For example, a class field trip to the Red Hills Area of Critical Environmental Concern, a property belonging to the Bureau of Land Management, was the starting point for an ongoing graduate research project inspired by an undergraduate's keen observation. During the summer, an endemic population of fish known as the Red Hills roach becomes restricted to the pools that form as the majority of the streams go dry. “We visited the Red Hills to follow up on previous surveys done by Peter Moyle at UC Davis and to monitor fish habitat during the prolonged drought. One of the undergraduate students noticed that all of the pools where we were finding fish were lined with sedges,” says Cover. Graduate student Alfred Brennan is now testing the hypothesis that stretches of spring-fed stream support sedges, which in turn create narrower and deeper channels that support the fish. 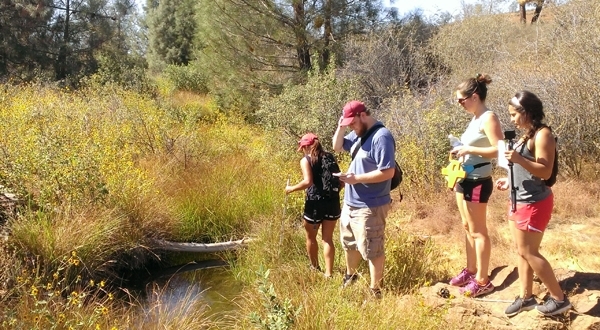 Undergraduate students surveying habitat at Red Hills. Photo by Matt Cover. Cover's students are already making a mark. 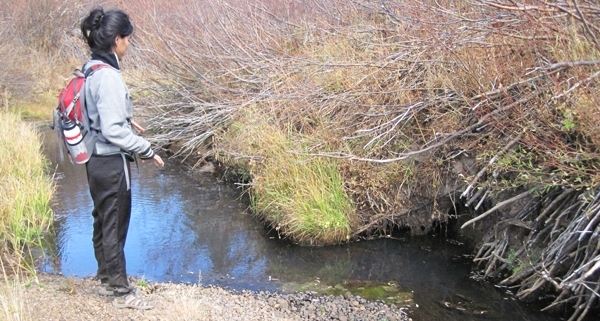 Former graduate student Felisha Walls is coordinating a program in the Livermore valley that connects communities with their neighborhood streams and watersheds. While she finishes writing her thesis, graduate student Elena Lombardo is working on developing a water quality database for KISTERS, an environmental consulting firm. Other students have gone on to doctoral programs or government agency positions. Cover is looking forward to seeing the impact his students will continue to have on the California water world.